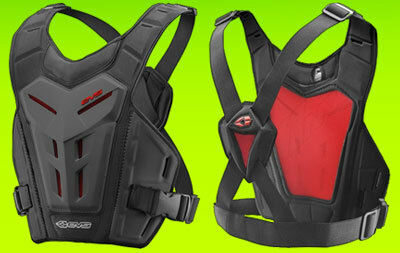 Motocross body armour protects your chest from impacts like stones, sand and mud or in case of an crash. 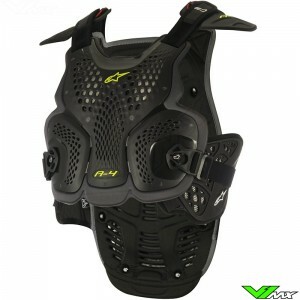 V1mx has a wide range of body armour from the best brands. Body protection is available in many sizes and versions. Below you will find information about the 3 most popular versions. 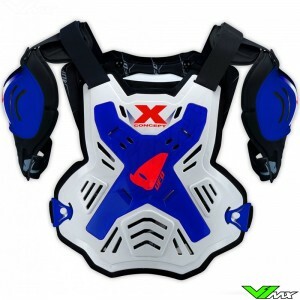 The chest protector is the simplest form of all body armour. This model only protects the front of your chest against impacts. The advantage of this version is the open back, which allows heat to quickly escape and keeps the weight low. Motocross body armour is made of hard plastic and is very suitable as protection of the chest, back and sometimes shoulders. 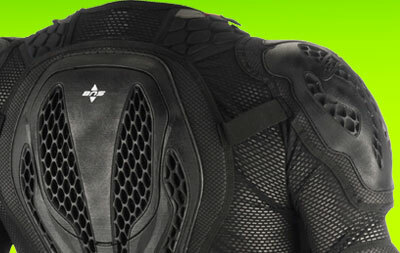 A body armour product is compact and allows maximum freedom of movement. It has good cooling properties, because the product is small. This model is widely used in the world championship motocross, because of the excellent performance. There are also motocross protections jackets available. This is a jacket with several protective components, such as protection on the elbows, shoulders, chest, back and sometimes a kidney belt, assembled in one product. The protection components are incorporated into a jacket with open structure material that can be closed using a string closure. The advantage of protective jackets is the extensive protection in all critical places of the upper body. Having all protection in one products is also convenient in use. You don’t need to carry a separate kidney belt or elbow guards. 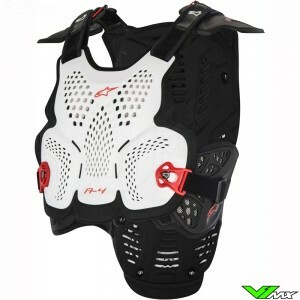 At V1mx you will find a wide range of motocross protection from top brands. One of the most recognized brands in the motocross world is EVS. 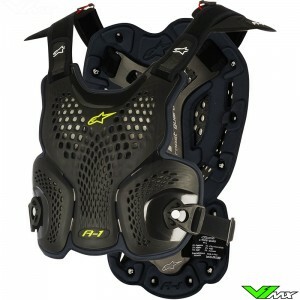 This company has been producing high quality protection for motocross and enduro riders for over 30 years. 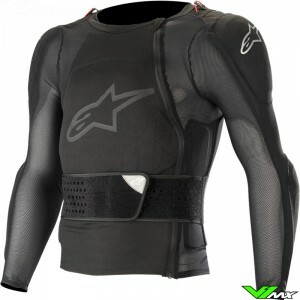 The EVS body armour are designed to provide maximum protection to the chest, shoulders and back, while minimizing the weight. In addition, the modular design provides a customizable and personal fit for optimum performance. 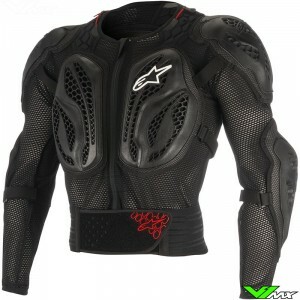 The Italian company Alpinestars produces a large collection of body armour and protective vests. 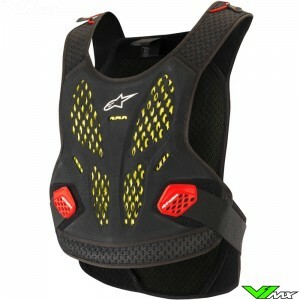 If you are looking for a protector with lots of ventilation, Alpinestars is definitely a brand you should take a look at. In the most recent versions, they use a unique open-structure material construction, which ensures maximum ventilation and low weight. 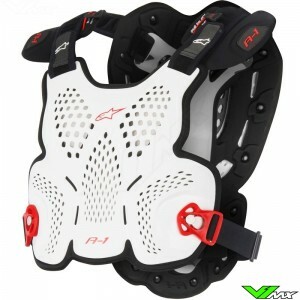 In addition, the protectors are designed to work with the Alpinestars neck brace for optimal protection. 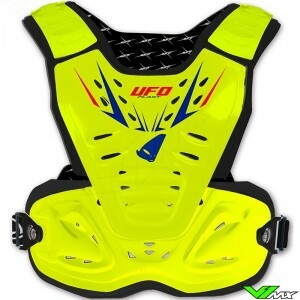 Another brands that is very popular among motocross riders is UFO. 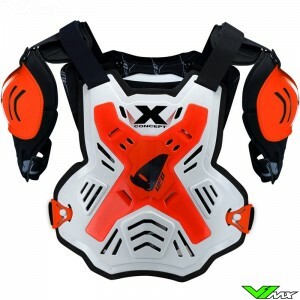 The UFO reactor 2 body armour is widely used because of the low cost and excellent performance. 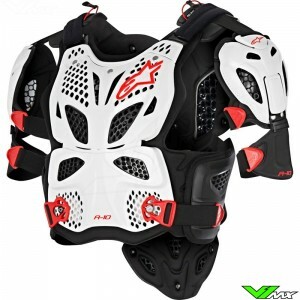 It features a hinge system for extra freedom of movement and is suitable for use with a neck brace. In addition, the reactor 2 is available in a wide range of colors. 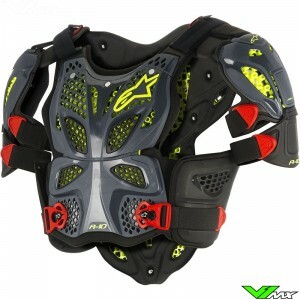 Motocross body armour is constantly evolving and new innovations are introduced every year. The most important features are explained below. Ventilation is an important feature because it improves rider performance and comfort. 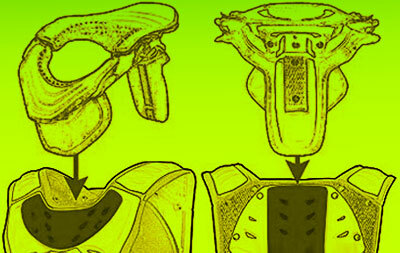 Most body armour is equipped with ventilation holes and channels that supply cool air. In recent years new protectors have been introduced which feature honeycomb material. Honeycomb technology helps cooling the rider a lot. More information about this technology can be found under the heading ‘material and construction’. Another feature that improves comfort is the comfort foam. 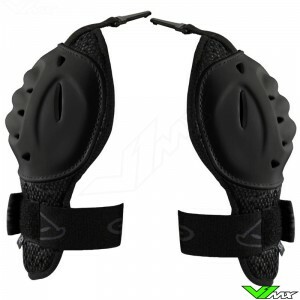 This foam is places on the inside of the protectors and ensures a comfortable contact with the skin. In addition, must quickly drain moisture and dampen impacts. The material and the construction of the body armour have a lot of influence on the performance. 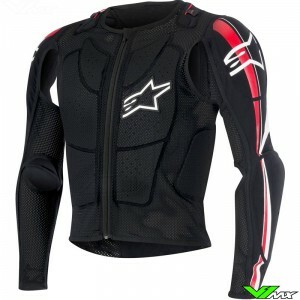 Alpinestars is a forerunner of new techniques that ensure better protection and performance. An example is the use of material with open structure, also called honeycomb technology. This ensures flexibility and optimum impact damping. 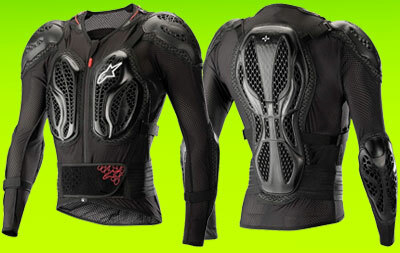 In addition, honeycomb material allows air to run through the material, which helps the rider cool. An example of honeycomb technology can be seen in the image above. Another new trend is the use of soft material that hardens during impact. The body armour is soft and flexible when you wear it. As soon as a hard impact hits the armour the material become hard and stiff, allowing it to dampen and absorb the impact. The degree of protection is described in the EN 1621 standard. If the body armour meets level 1, it is good at damping an impact. If you ride competitively at high speeds, level 2 is advised. These offer better damping and protection in case of a crash. 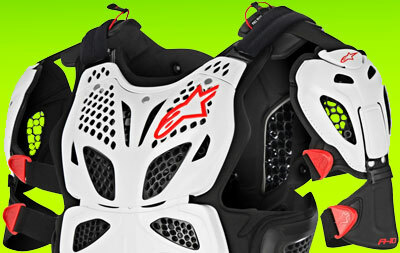 Another important feature of the motocross body armour is the compatibility with a neck brace. The brace is used to keep away forces from the neck. The neck brace must connect well with the protector to work optimally. 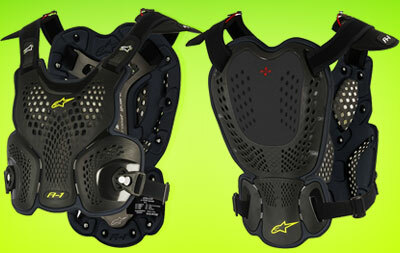 Products from Alpinestars are designed to work together with the BNS neck brace. It features a pull-tab that can be connected to the brace, which makes sure it stays in position. UFO also optimizes the body armour for use with a neck brace. 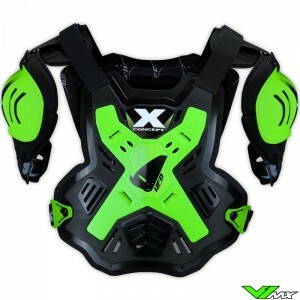 The UFO Reactor 2 has a flat piece on the chest and back, designed for the placement of a Leatt brace. 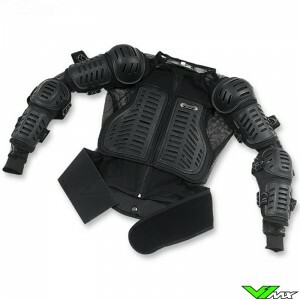 There are many different types of body armour available from a wide range of top brands. Do you have any questions about the products or about placing an order? Feel free to contact V1mx’s customer service. 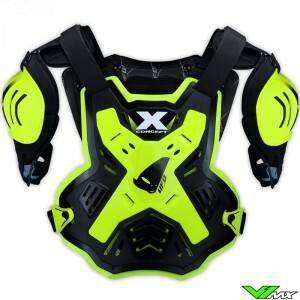 We are happy to help you with ordering the right motocross gear. We also provide a size table at every product, allowing you to easily select the right size.